IS IT LIVE, OR IS IT MANCHESTER? The Picturedrome in Holmfirth is a great gig venue, an old cinema stripped out and painted black inside. A quick jaunt up the M1 for an evening with Ian Hunter would be birthday treat enough for your ever older scribe. To hear the sound that night better than ever in this venue is a credit to the unspoken crew of any gig who make or break the experience with their expertise. The levels were right, the mix was clear, the correct amount of compression was dialled in avoiding the wall of fudge so often inflicted by lazy use of limiters and that would have been enough for a great night. Just like in the old days there was a support act. The first time your Old Scribe, when just the Boy Scribe, saw Ian Hunter, with Mott The Hoople, the support band were less impressive. "Who were that lot then?" Quoth the Old Scribe to assembled friends, "They'll never get anywhere". 'That lot' were a band called Queen. "The Old Scribe once said Queen will never get anywhere?" squeal the plebs chorus, stage left, "We hope the Old Scribe's judgement has improved since 1974!" Seeing bands in their early days on unfamiliar stages is a risky business. The gamble pays off for Federal Charm. On this occasion, between every song, your Old Scribe's comments were entirely positive; Federal Charm function like a tight unit of individually talented musicians. Like so many great guitar bands, they're based in Manchester, founded by Paul Bowe (guitar) and Nick Bowden (vocals and guitar), in the Summer of 2011, which was sometimes quite Summery, unusually for the UK. Continuing the Old Skool British Rock and Blues vibe, they used a trad 16-track format (sadly not an analogue tubed Studer) to write the songs for their debut album. Check out that last sentence plebs, they went for a debut album, not a debut YouTube clip. That alone deserves giving them a listen. When some studio time and gig opportunities became a possibility they recruited local stalwarts, Danny Rigg and L.D. Morawski, and got in the van to the studio. Occasionally an ensemble just gel, and together make so much more, and this lot felt that vibe, the first time they plugged in and played together. So off they went on t'road (well they are Lancastrians). "Why is the Old Scribe writing to an international readership about a new band in Manchester, on the most trusted source of audio reviews on the web?" Challenge plebs chorus, stage left. Good audio systems allow us the vicarious experience of hearing bands who we can't get to see. That's the whole point of audiophilia nervosa, to keep pursuing audio excellence so that we can hear long dead musicians, musicians who aren't touring just now, seminal performances and groundbreaking albums, and musicians who aren't big enough yet to come to our town. 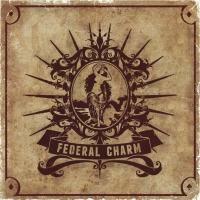 Federal Charm's debut album, imaginatively titled, The Album, sums up the band's position on the whole concept of albums. It is well recorded and pressed at a sensible level for dynamics. This is as good as it gets for rock CD's, other than that tiny handful recorded by audiophiles for audiophiles. Recordings of some voices can be lame compared with their live performances, and some record well but disappoint live. Nick Bowden's vocal range and inflections work both ways and the emotional delivery hints at Spin Doctors' Chris Barron's early performances. The Spin Doctors spring to mind again at Danny Rigg's lively drum sound couple with the melodic powerhouse bass from youthful Laurence 'L.D.' Morawski. Meanwhile guitars hint at Free or Argent (or Zombies) then soar to Mountainous moments or even swoop to Weir and Garcia. Such diverse comparisons might imply incoherence but Federal Charm are tight as the proverbial fowl's posterior immersed in water. Federal Charm deliver these unique goods equally well live and on this recording. They've learned their craft from past masters, then stood on the masters' shoulders to get further. For those in the chorus who're near to Holmfirth, they're playing the Picturedrome again, supporting Blues Splash on November 9th 2013. Go out of your house/apartment/yurt and buy more vinyl/CD's/hi-res downloads NOW! Don't waste any time thinking about it. Just buy more stuff to play on your hifi NOW!! !